It is nice to lose yourself in a new city when you are traveling, but there are countless instances that you need to stay connected - whether with your loved ones back home, or to the office if you're on business travel. Before the ability to call using prepaid phone cards was enough, then when cellular phones came, the ability to call and text became de rigeuer. Now, with the proliferation of smartphones, having a data connection became a necessity, for checking emails, looking up information through Google, posting status and tweets in social media sites, checking in on Foursquare, and accessing maps when you can't seem to find that small cafe that the bloggers have been recommending. For the requirements mentioned, the first option would be to bring your smartphone with a pre-activated line from your home country and just set it to international roaming. Roaming has one advantage: people from where you came from can call and send you text messages by just using your old number, and you can reply to them as if you never left. The big downside for roaming, of course, is the price, which can cost you an arm and a leg. Data roaming is even more expensive (more like highway robbery, really). I've tried checking in on Foursquare using data roaming a few times I was abroad, and each check in would cost around $4, for just a few kilobytes of data used. The logical option would be to get your own local SIM in the destination where you are headed. If you came from Asia (or Europe for that matter) and you're traveling within the region, this would be easy, as most of the countries from the region uses the GSM standard. If you have an unlocked phone, all you need to do it buy a prepaid SIM, pop it inside the phone, and viola, you're connected! If you are traveling to the United States, picking a prepaid SIM would be a bit complicated, as the prepaid model is not as prevalent as it is in Asia. It also becomes a tedious exercise once you realize that not all of the phone companies use the GSM standard. Others use the CDMA, and your GSM phones won't work with it. Also, the emphasis on prepaid services is always about call minutes and text messaging. This is OK if those were your only requirements. You can just go to Best Buy or Walmart and you can pick up a prepaid phone (either GSM or CDMA won't matter) kit for a low as $15, and you only need to spend about $2 a day to get unlimited domestic calls and text messaging. If you're going to need data, then the answer is not a straightforward. 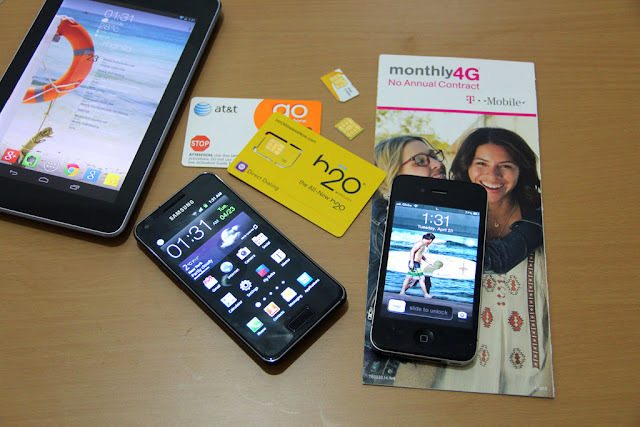 During my last trip there, I spent a fairly good amount of time researching for the best prepaid SIM for my Android phone (a Samsung Galaxy S Advance), one that could give me unlimited domestic calls and text, international calls and text, and sufficient amount of data that I can use for emails and social network access. 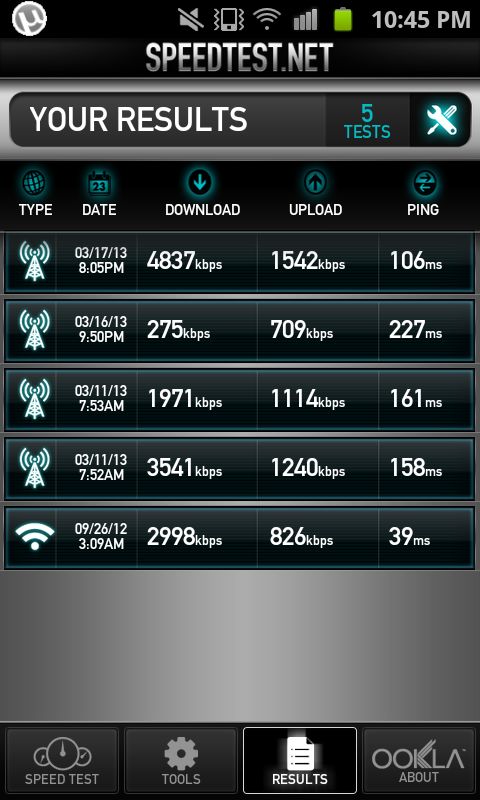 The carrier I chose was called H2O Wireless. It is a mobile virtual network operator that uses the AT&T network, which means you can use its prepaid SIMs on your GSM phone. I think H2O hit the sweet spot that I have been looking for. The SIM costs $10, and for $50 a month, you can get unlimited domestic calls and text, 500 megabytes of data, 100 free international texts, and $20 credit for international calls. Calls going overseas cost around $0.40, so that would give you approximately 50 minutes of calls. The 500 mb of data is not for power users (this is half of my data plan here in the Philippines) but is sufficient for accessing Facebook, Twitter and Google+, maps, and Google search on a daily basis. In fact, I don't think I've used up everything during the 3 weeks I was there. I was also able to test the connection speed of the network from several locations, including St. Louis, Chicago, Minneapolis, Detroit, New York, Boston and Cambridge, and I did not encounter that much of a hiccup. In fact the data connection was fast majority of the time, and there are some cases that I was able to use the HSDPA connection (3.5G). Using the Speedtest app, I got as high as 4.8 mbps, and the lowest is 275 kbps. Of course your requirement could be different from mine. I summarized the services you can get from three carriers that I evaluated during my search - AT&T, H2O and T-Mobile - above. I left out Verizon and Virgin Mobile because they use CDMA. You can get the prepaid SIM from specialty electronics stores like Best Buy or Gamestop, or from the designated kiosks they put up in a mall. Once you purchase the SIM and the top-up card, the store personnel will help you with the activation process. I find the activation process a bit of a chore though. Here in the Philippines, you can buy a SIM just from about anywhere, no questions asked, and you can use it right away. In the the United States, they are required to get your name, ZIP code and address, and sometimes, credit card information. But after the activation process you're good to go. Another thing that I appreciated with H2O wireless is that you don't need to fiddle with the settings to get it running. You can download an app from the Google Play Store or the iTunes store, and the app will automatically change the settings of the phone and make the data connection working. I did not use the SIM for my iPhone, as mine is carrier-locked to my local carrier, so that's something to consider as well. Make sure your travel phone is unlocked. finally found this Kin! thanks! My iphone is locked to Globe. I'm not sure if I want to have it unlocked or bring another phone to use (I have an Alcatel or Samsung) for the pre paid sim in the US.